My dad, Ernest Russell Melbourne Parker, died thirteen years ago today. If my mum was a piece of work, my dad was a work of art. He’d always wanted to be a priest – a vicar in Australia, where he was born – and my uncles told me he would stand on a soap box in the back yard and preach to the chickens. When my grandfather was transferred to America, it was the middle of the Depression, and my dad dropped out of school (as did many young men at that time) and joined the U.S. Navy – one less mouth to feed at home, a quicker way to get his citizenship, and the Navy would train him to be a chaplain. Unfortunately, after Pearl Harbor, they needed him for other things. He had been injured pulling other men to safety, and after he got out of the hospital he served as an abatu, training other men to go overseas. After the war, he was “mustered out”, and went to work for the phone company. I have told you everything I know about his military career, and I probably made up half of it. Men of his generation never talked about it. As a layman, he served in every possible position in the church. He was Sunday School superintendent, Senior Warden, Junior Warden (financial and property managers to you non-Anglicans), a chalicist, a lay reader, treasurer, you name it. At one time he was the only lay person in the diocese licensed to preach his own sermons. He was a member of the Brotherhood of St. Andrew. His friend and mentor, Fr. Carroll Eads, said at his funeral that if it had been physically possible, “Ernie would have run for president of the Ladies Group”. He did not actually get to seminary until he was 60. It was incredibly hard for him, I know, to go back into the classroom, so much older than all of the other students, and learning to study again. People talk about what my dad accomplished, but I do have to give my mum a lot of credit. They left a lovely home in Maryland to live in a tumbledown rental in Cowan, TN, while my dad attended Sewanee. He studied, and she typed his papers, shoveled the snow, took out the trash and balanced the checkbook. It wasn’t easy for her, either. He often said she should have been ordained at the same time he was. After about ten years at St. Mark’s, in Roxboro, NC, he had taken an exchange parish is Chichester, England, for six months, in 1992 or ’93, and had accepted a call to return as their vicar. He and my mother were busy packing, getting the paperwork in order for her to emigrate (since he was born in “the Empire” he didn’t have quite as much to do), and another eight million things to do, and he began to become very forgetful. He put it down to stress, but it got to the point that my mum finally managed to get him to the doctor. “Practically at gunpoint”, she said. He had a massive brain tumor. Unfortunately, during his forgetfulness, he had neglected to take his HTN meds, which destroyed his kidneys, and he spent the next eight years of his life on dialysis, and was not able to return to the U.K. He never gave up, though. They returned to Baltimore, and he took a tiny church, Holy Cross on Millington Avenue, and served them for a pittance until his death. He used a walker to get down the aisle, and had a bar stool behind the altar because he couldn’t stand up for the entire Prayer of Consecration. He was writing a sermon when he died. I asked the girls if they had any special memories of their grandfather. Our oldest is a neat-freak, and she used to drive my dad nuts by “straightening” his desk. She’d gather all of the papers, and stack them up by size, into a neat little pyramid. He finally had to make a tent sign, “Tina, keep off my desk!” Our middle daughter remembered “log-rolling” in the back yard on the big reels that held telephone cable; he’d bring them home to use as tables on the patio and such, and the girls would turn them on their sides and roll across the lawn. Our youngest remembered the smell of his pipe, and him letting her “polish” her shoes with his shoe buffer. Give us grace so to follow your blessed saints in all virtuous and godly living, that we may come to those ineffable joys that you have prepared for those who truly love you. Now about your Father. 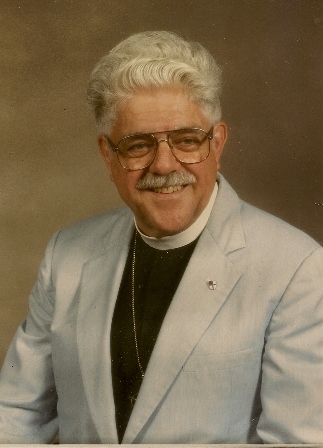 He was the best Sunday School superintendent that we had ever had (and that includes Patsy) that I had seen in my 60 years there (I guess you can’t count my early years). Anyway, he always was dressed so nicely and had that great mustache. He was very gentle in his speech and always had something funny to say each week that got us really thinking. The children would always meet together first and take up collection and say a prayer, etc. in the upper parish hall and then divide up into their class rooms. He would always lead them in a song. I think he taught the older class and subbed where ever needed. I guess what I remember most is that you could always count on him being there and taking charge. I don’t remember any of the kids (or the parents) there not liking him. We did always wonder about his other family. Patsy was there and things just ran really smoothly – everyone worked together.